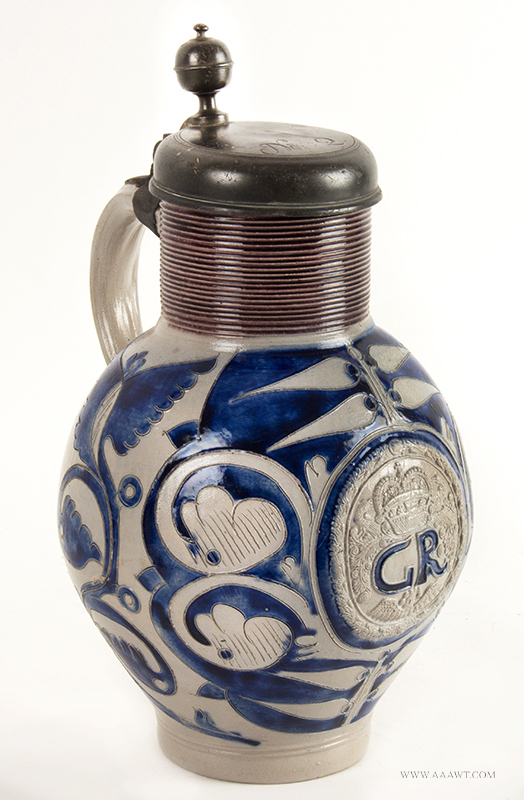 The surface is orange brown, white pearl decoration, and other applied molded ornament; cobalt blue enamel painting, salt-glazed and pewter mounted. 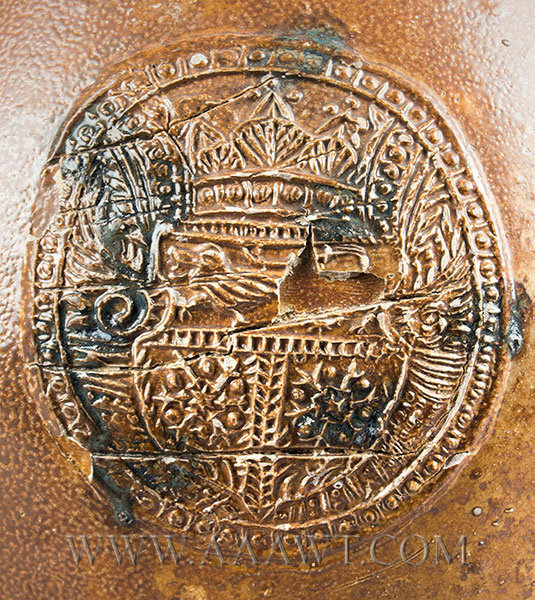 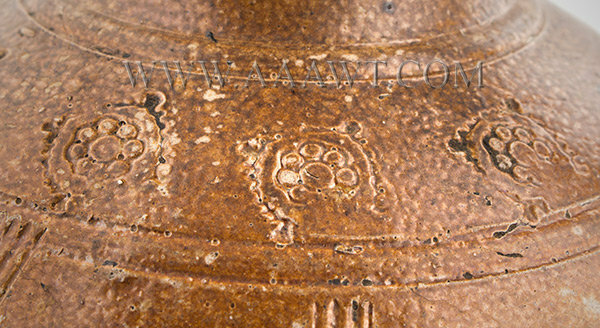 The interior of pewter lid displays maker’s marks dated 1708. 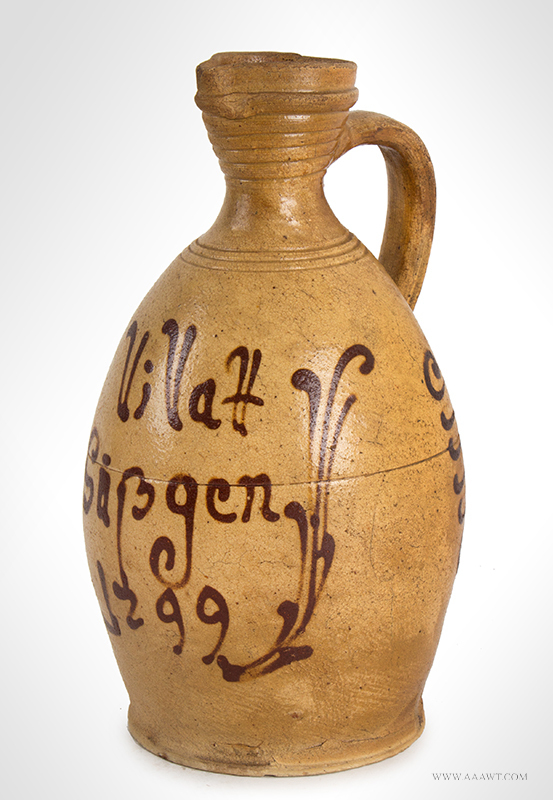 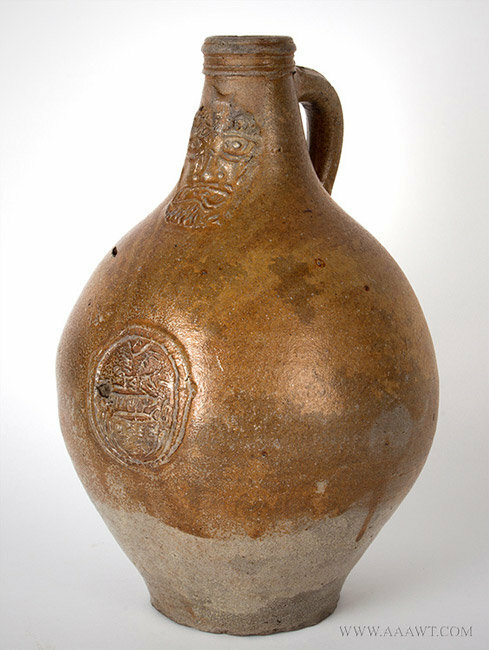 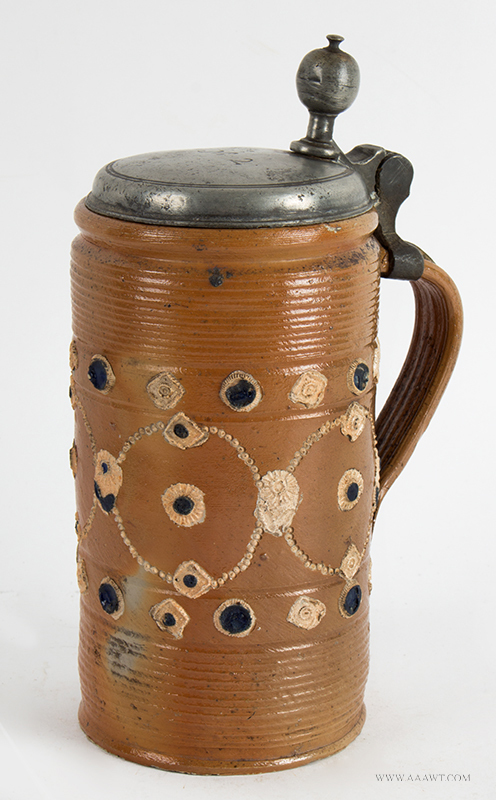 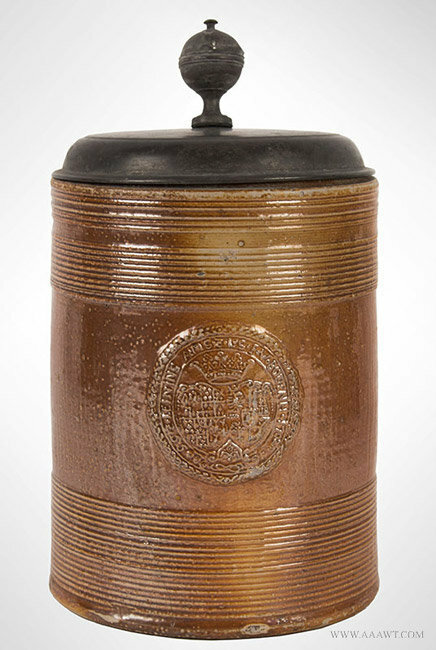 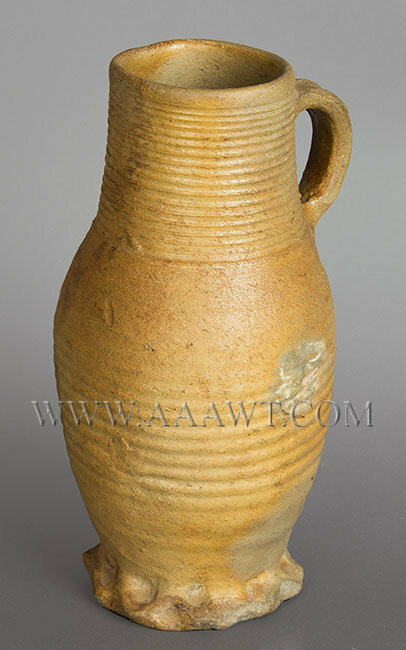 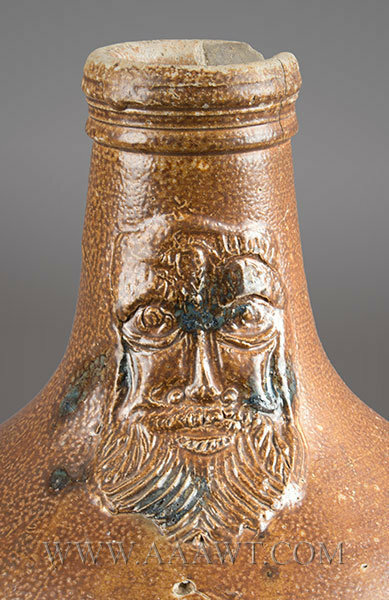 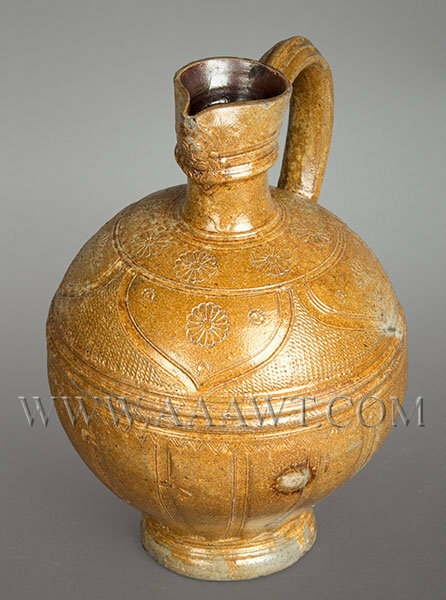 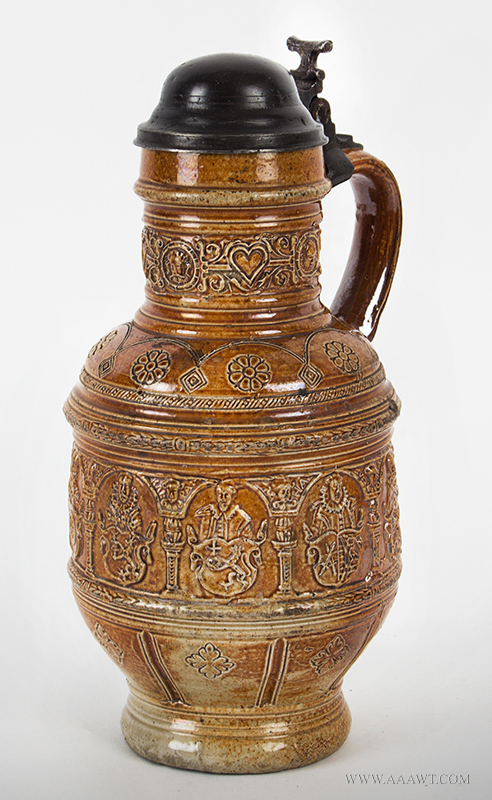 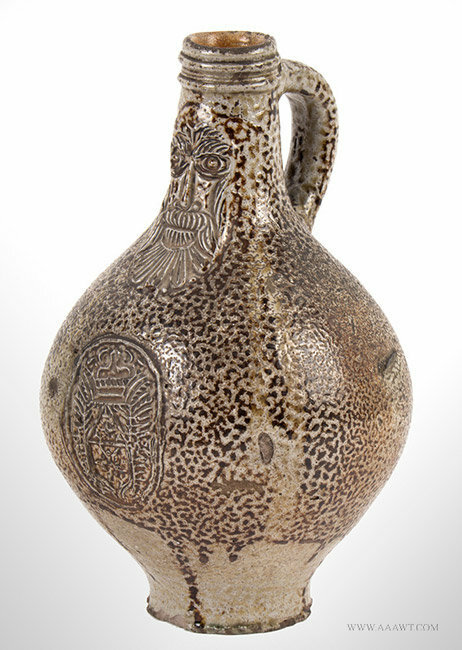 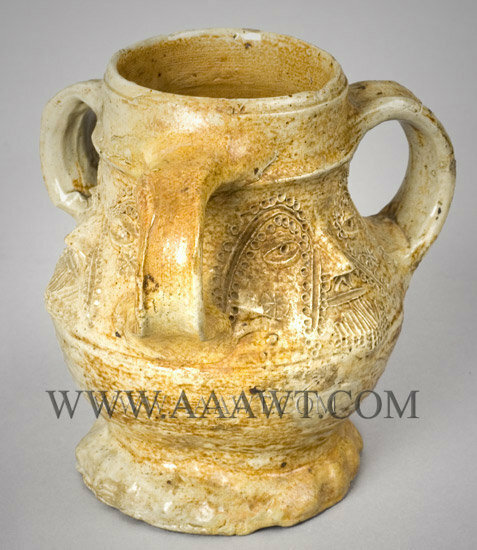 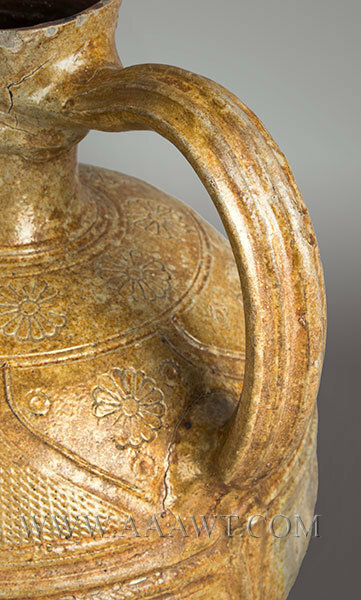 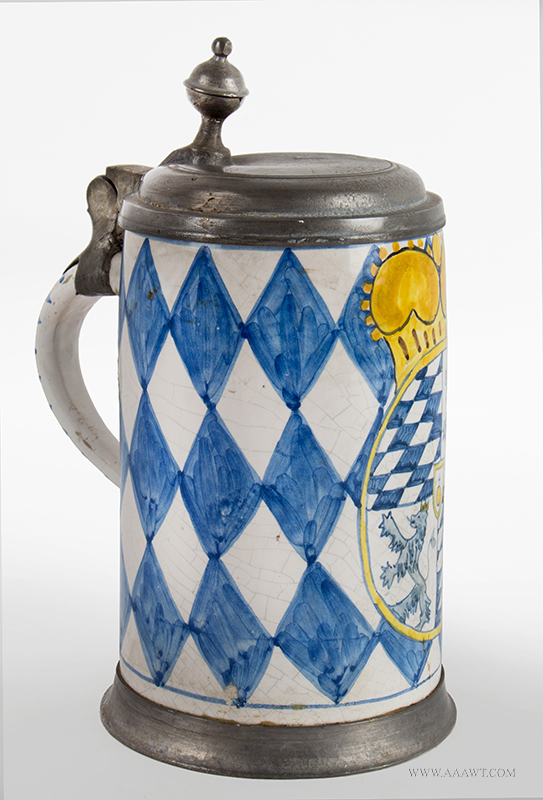 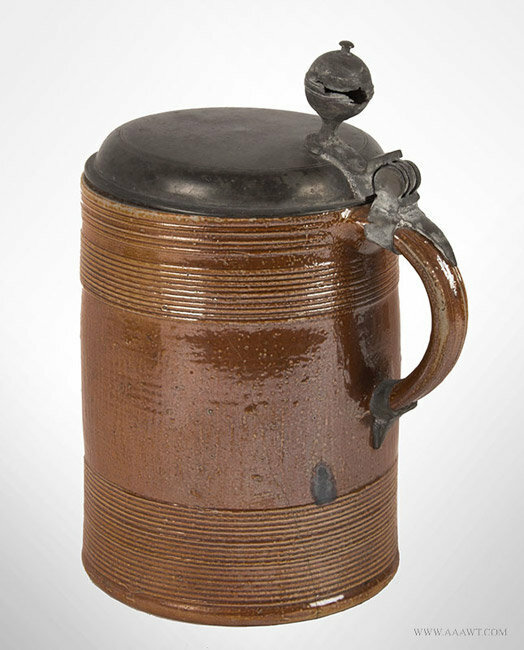 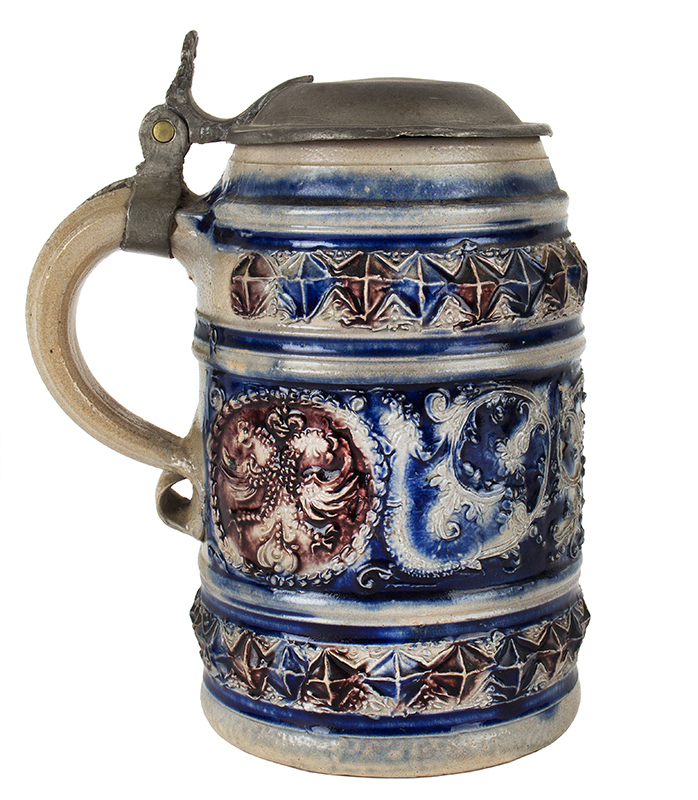 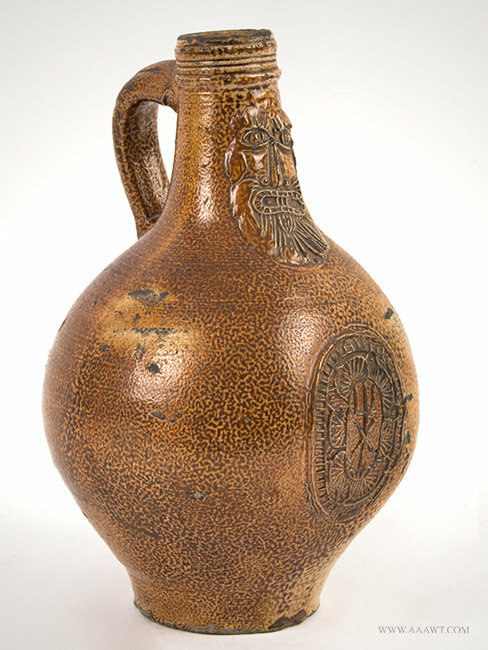 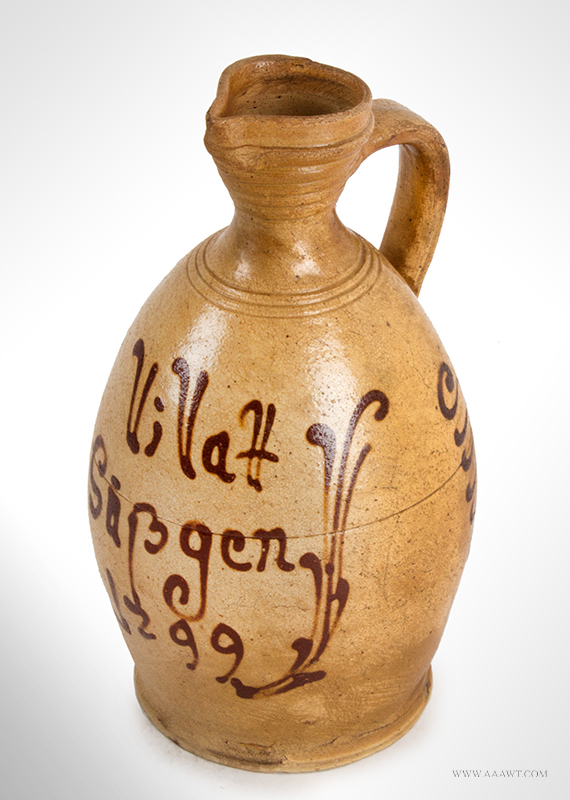 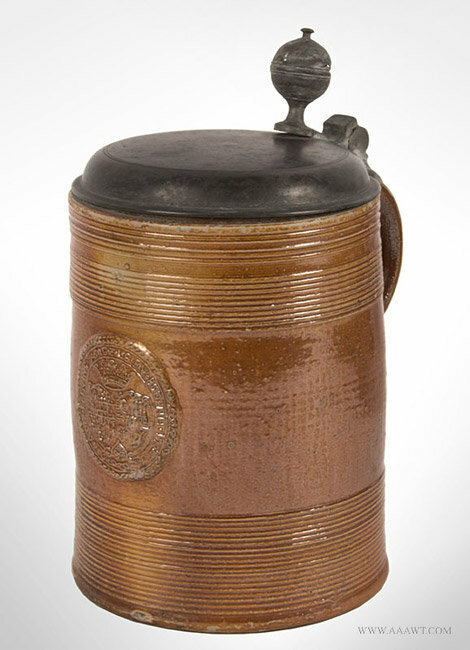 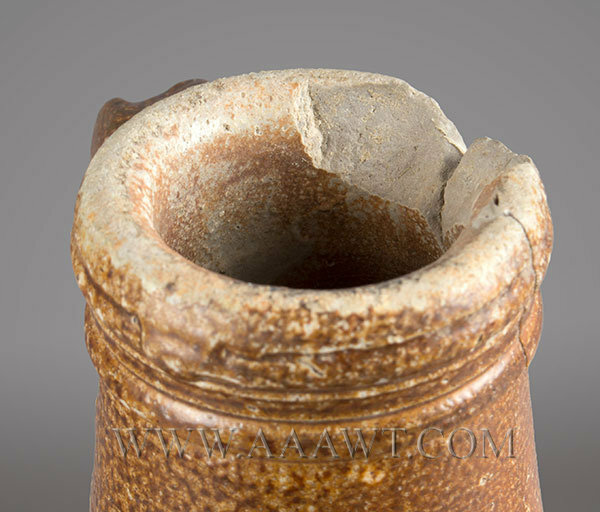 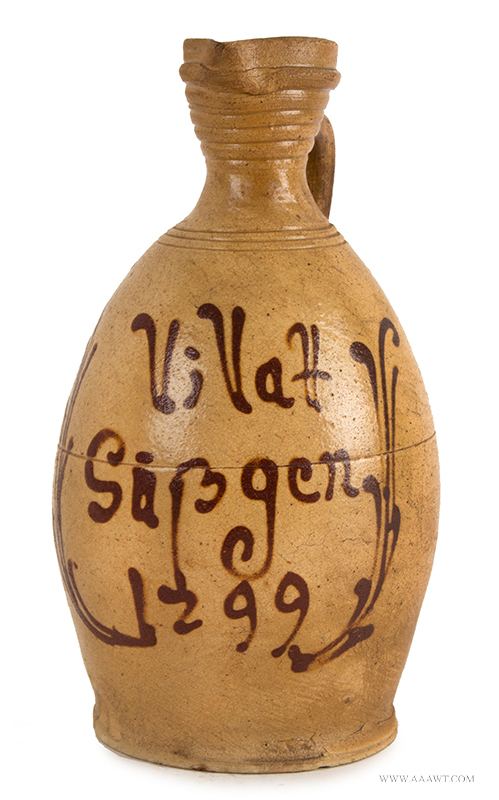 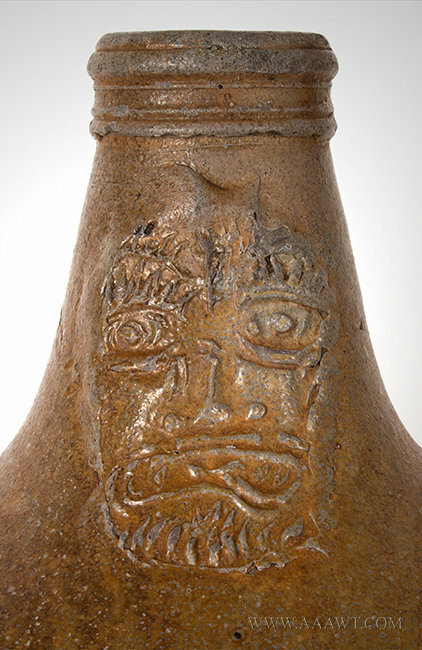 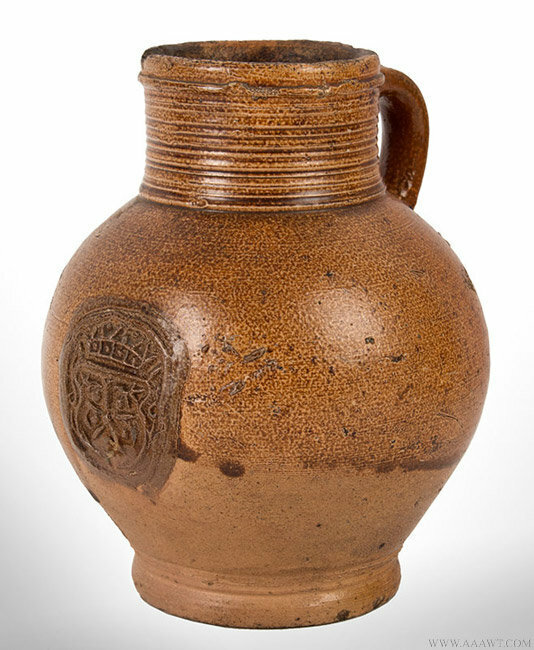 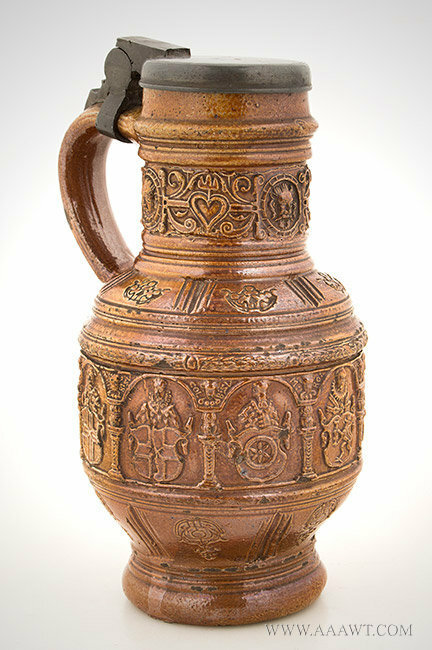 See pages 44 to 59 of Early Stoneware Steins from the Les Paul Collection pp. 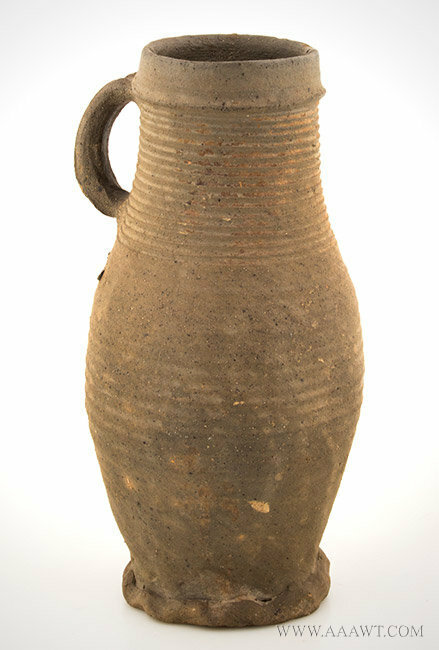 44 to 59. 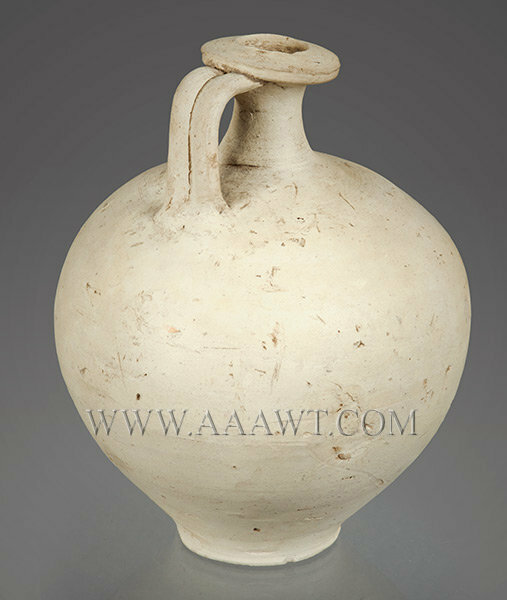 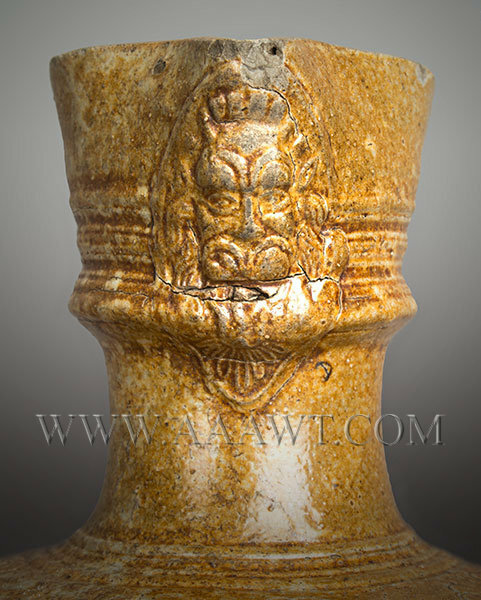 Height: 8.75"
Mask on pulled spout, funnel shaped neck, globular body, ring base, ribbed handle with long terminus, expected and accepted wear to tip of spout, else fine and original. 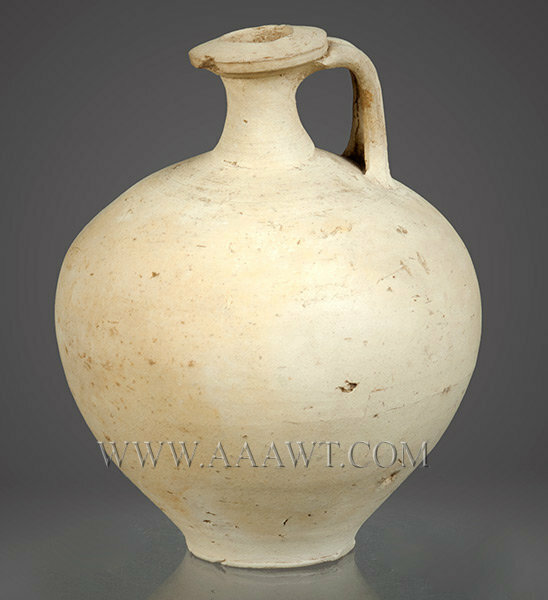 The white high density clay was found in Germany, France and small areas of England at that time. 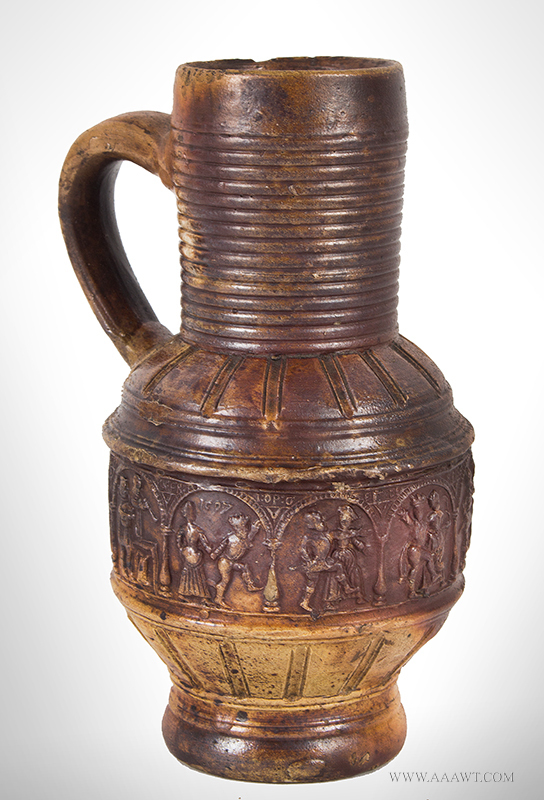 Vertical panels showing mercenary soldiers with straight spears; Calvary soldier on horseback raising scimitar, the old city of Vienna and fighting Turkish soldiers with raised sabers. 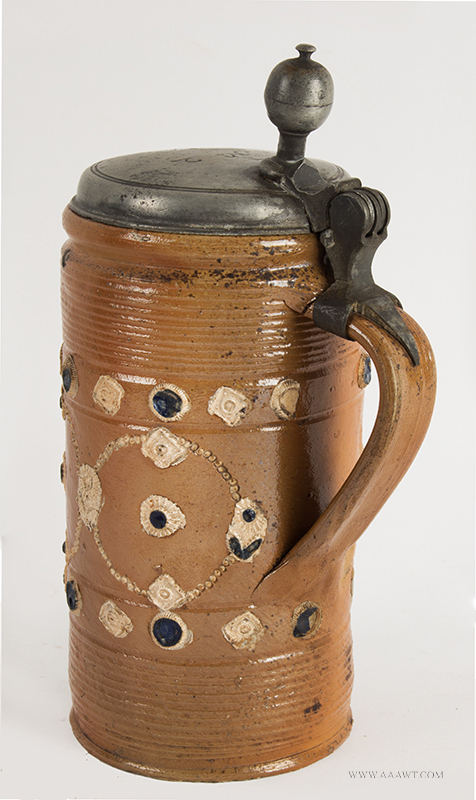 See Early Stoneware Steins from the Les Paul Collection by Beatrix Adler and Les Paul; similar type pictured and discussed on pages 368 and 369. 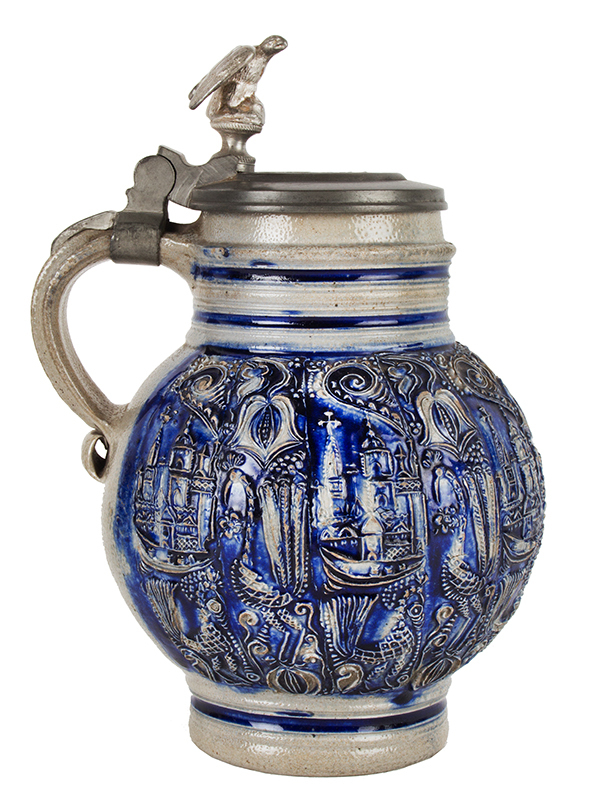 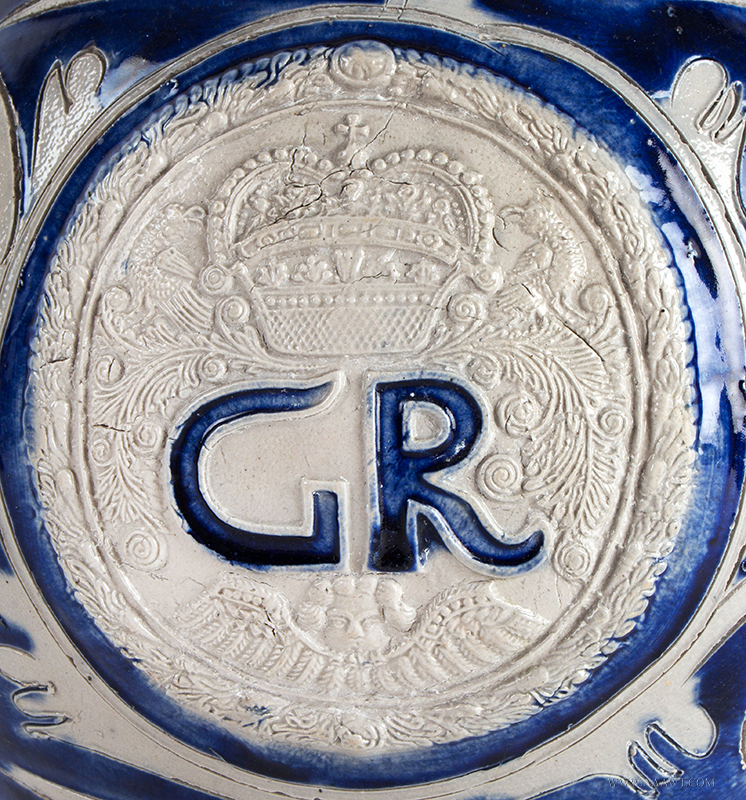 Ball shape stein covered with narrow vertical panels featuring city views and peacocks brushed in deep cobalt. 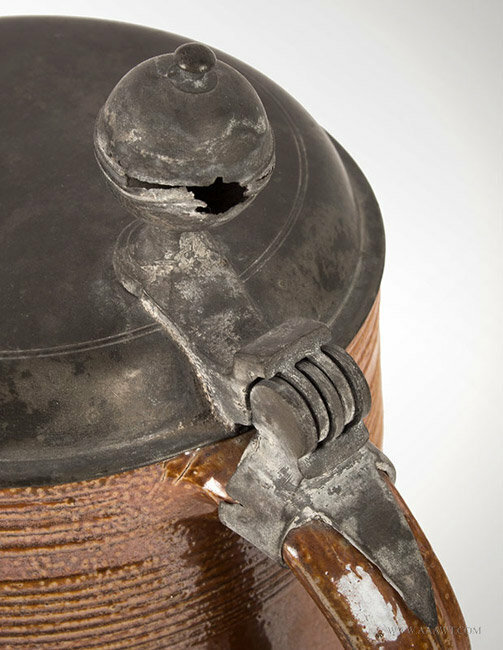 Crisp molding with scattered minor wear to high spots; pewter lid is a later addition. 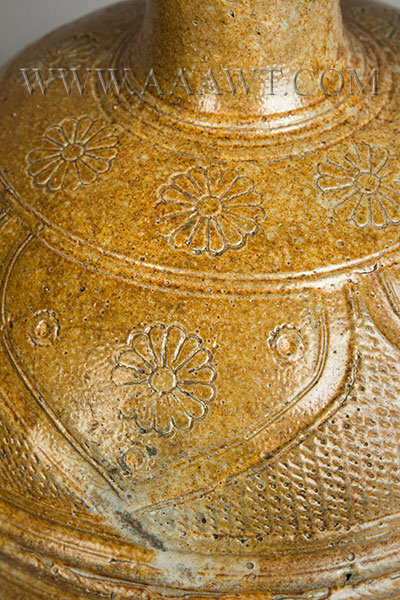 On the right is a small overfired area, nonetheless…a beautiful piece. 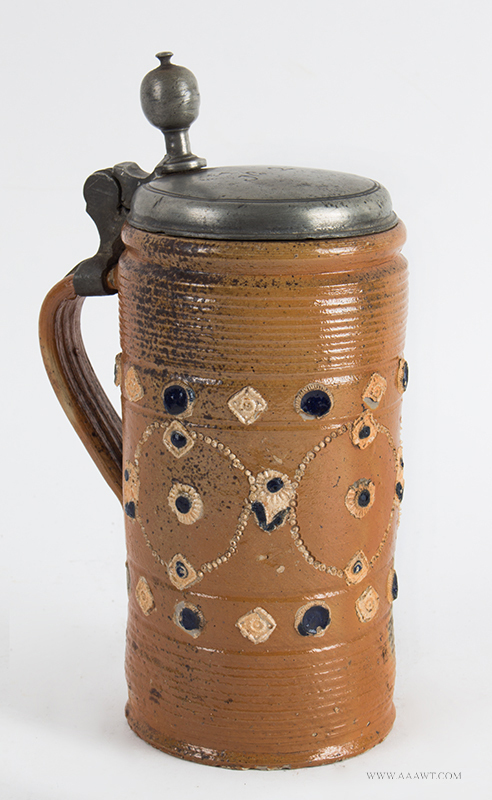 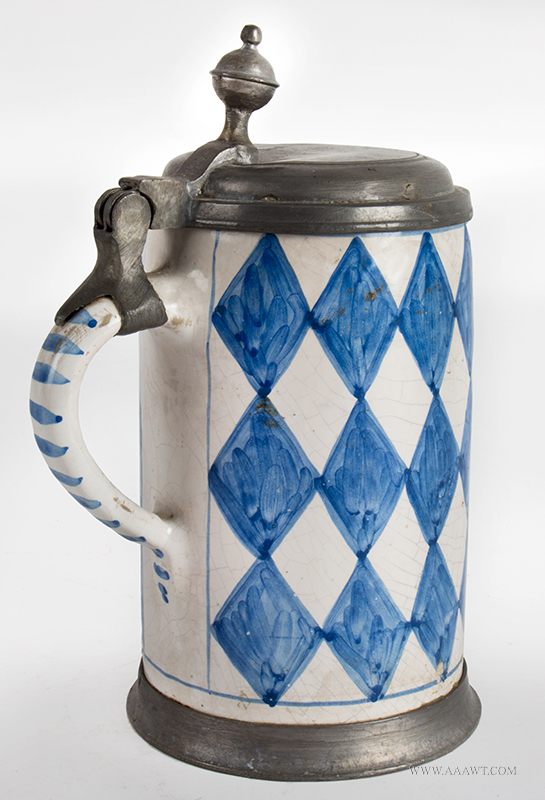 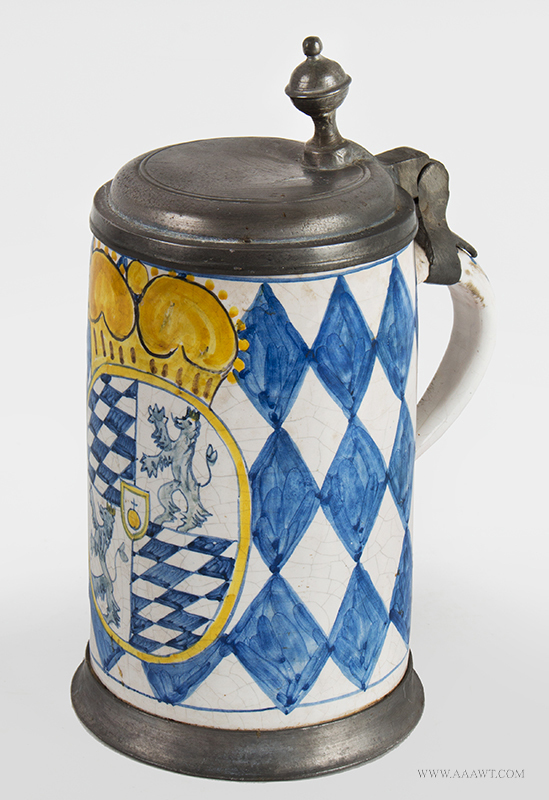 See Early Stoneware Steins from the Les Paul Collection by Beatrix Adler and Les Paul; similar vertical panels pictured and discussed on pages 368 and 369. 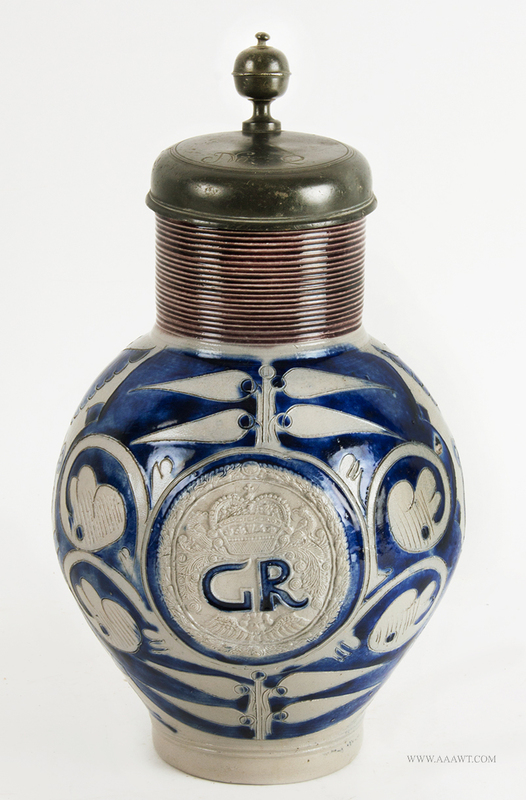 Fine quality, floral and heart decoration brushed in deep cobalt and manganese; pewter lid with shell thumbpiece dated and initialed…” ICG” - “1750”. 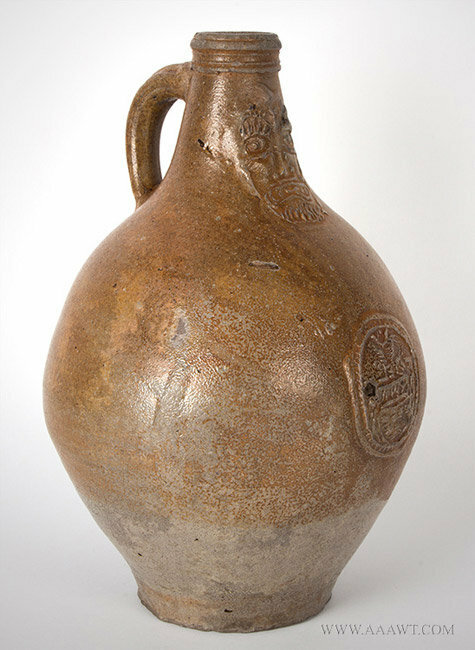 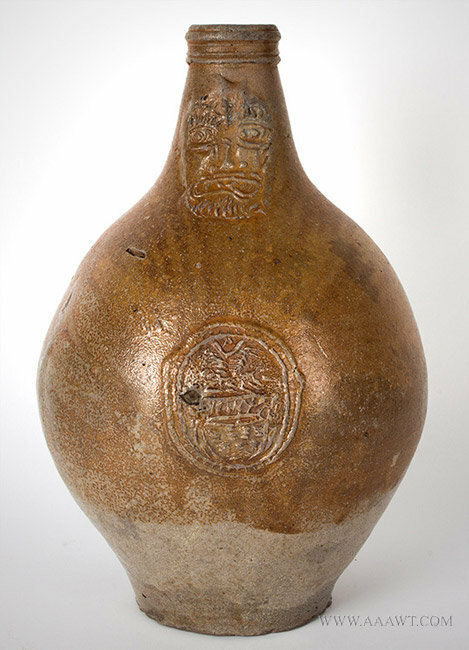 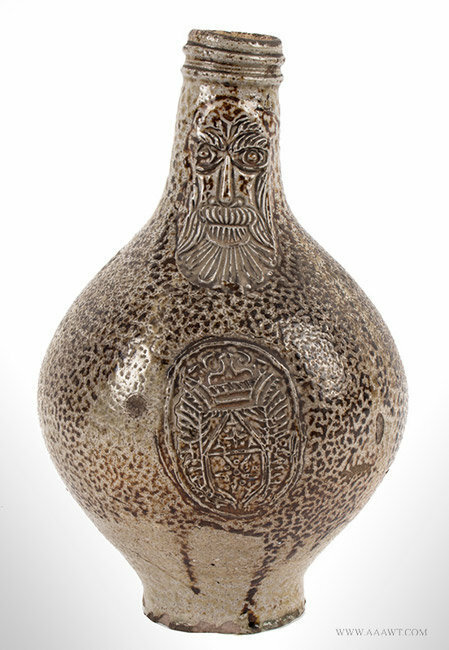 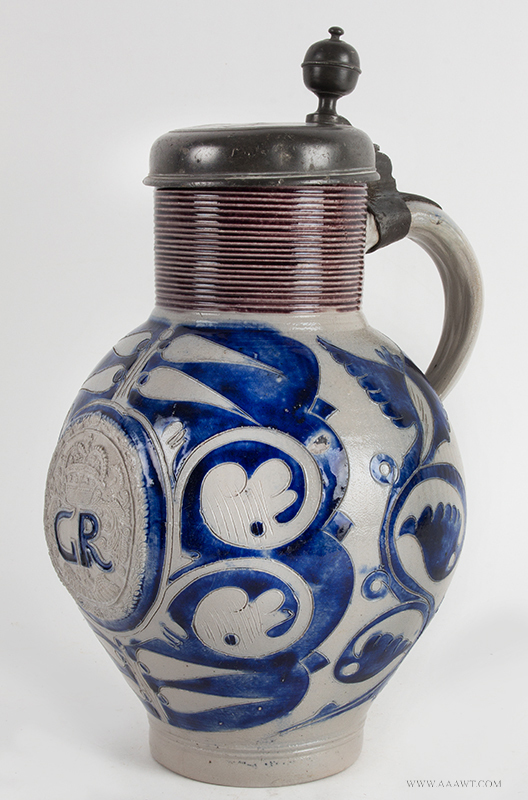 Bulbous form with pronounced neck cordons; robust strap-handle features four-finger-tip-impressed tapering strap terminus; neck decorated with a scarcely encountered “square” beard facemask above large medallion bearing the seal of Amsterdam. 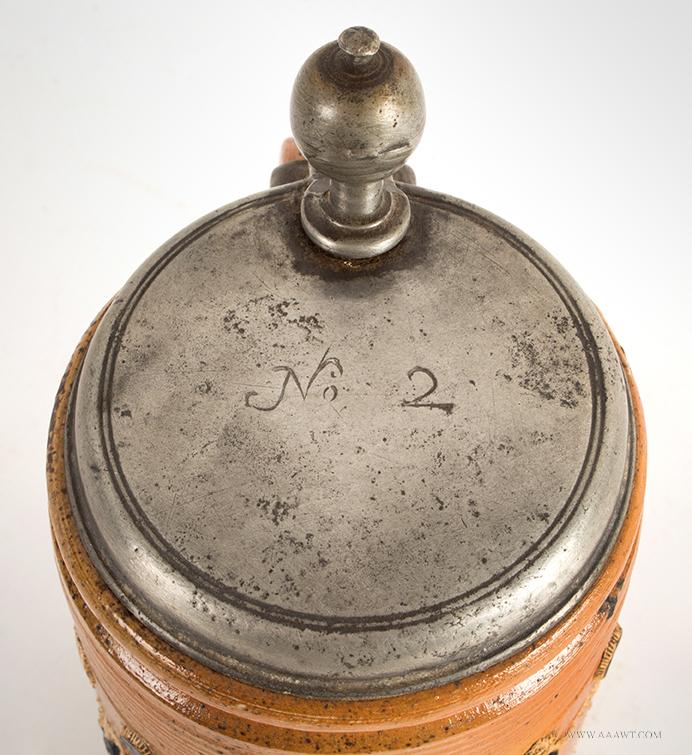 Excellent original condition; .25" chip to rim at handle; hidden by lid, else fine. 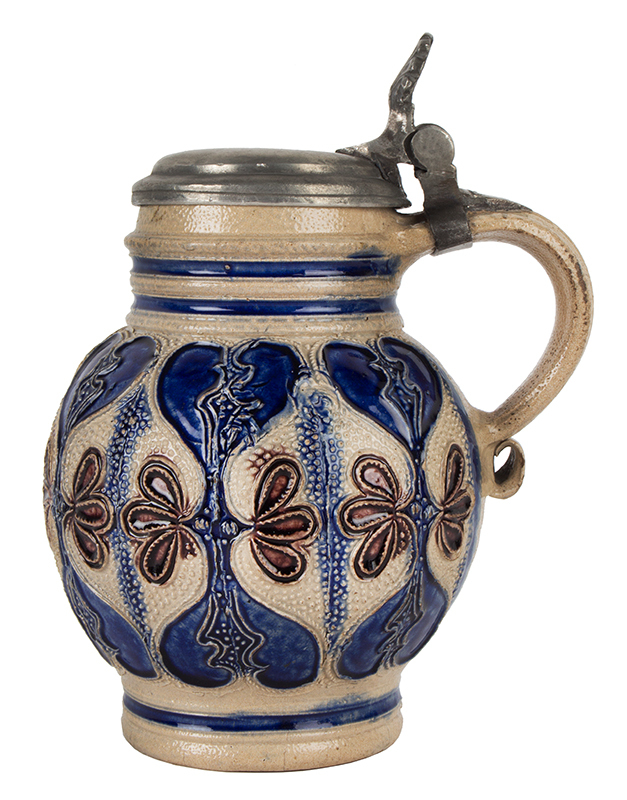 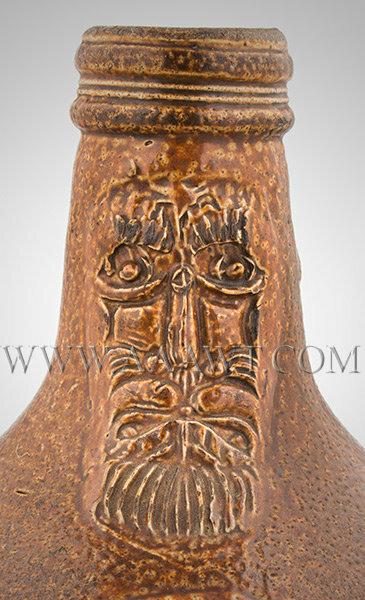 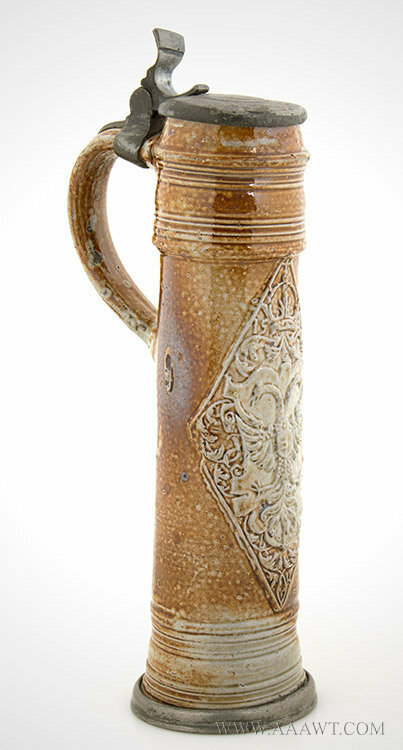 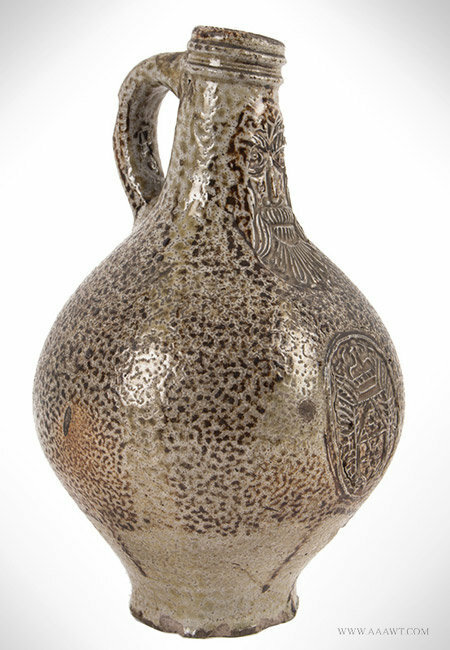 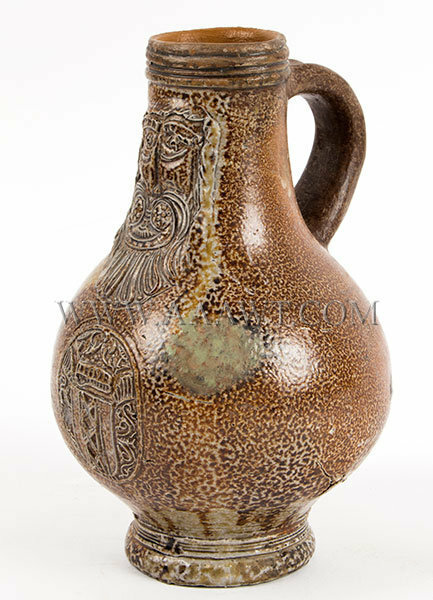 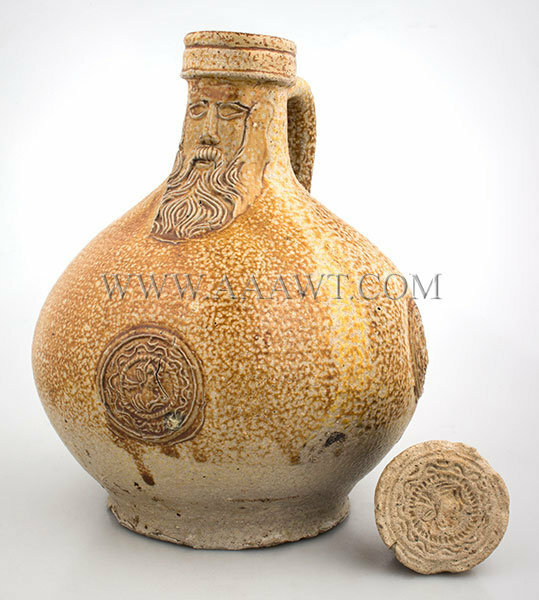 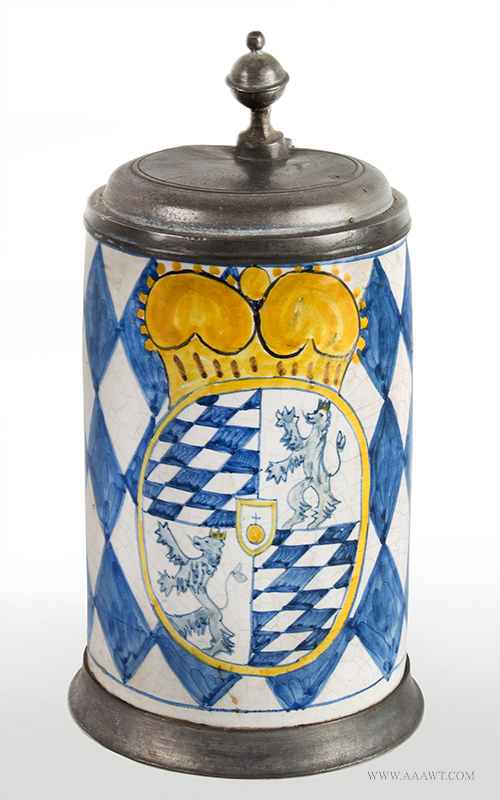 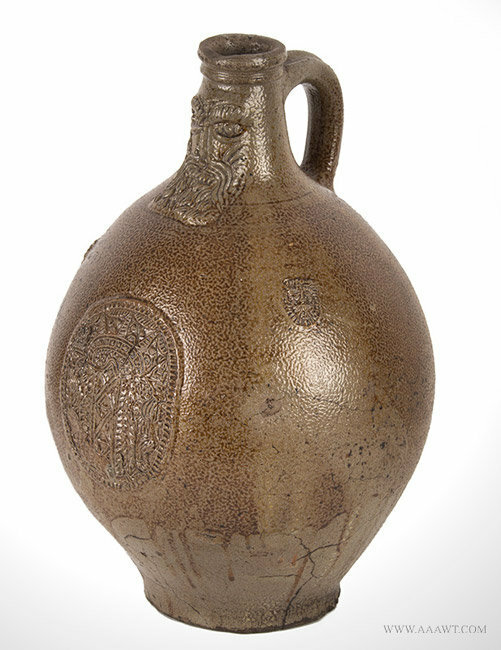 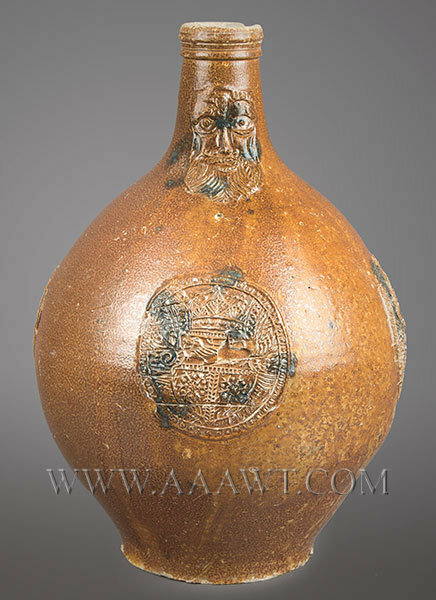 See German Stoneware 1200 to 1900 by David Gamester, pp., 37 to 40 for mold technology. 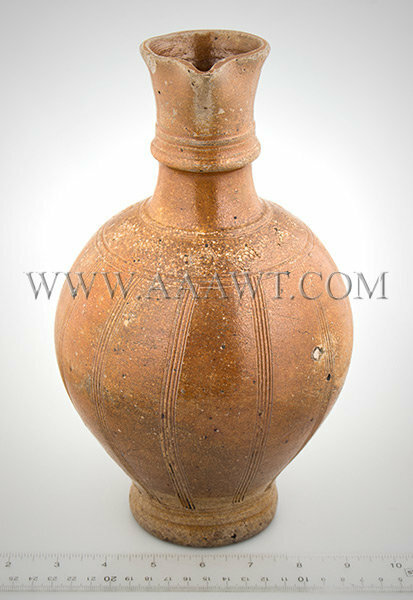 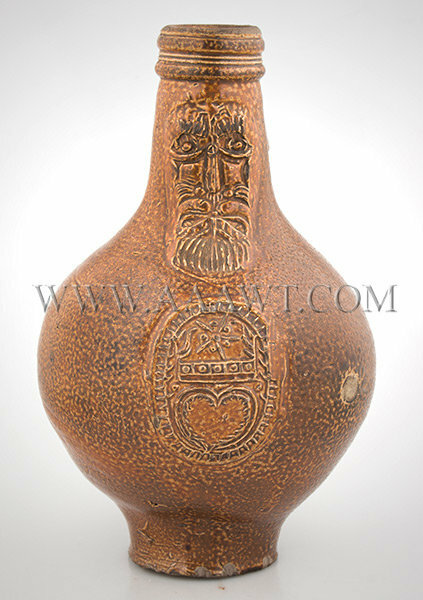 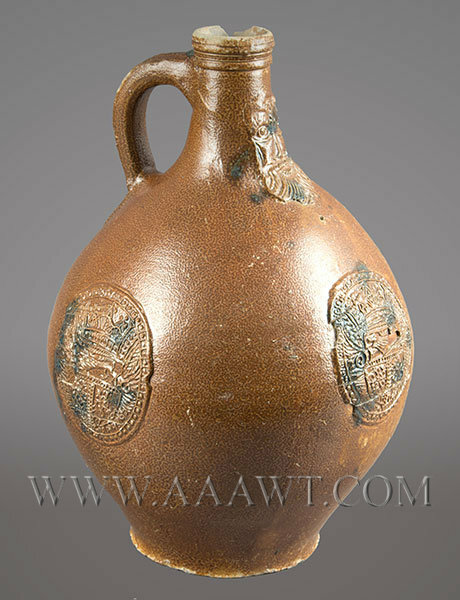 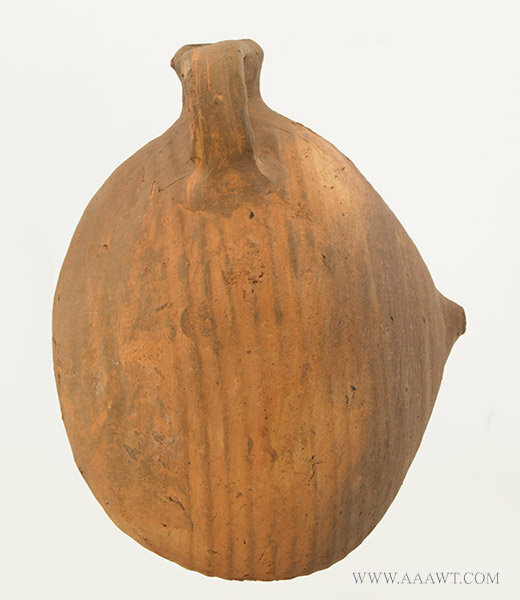 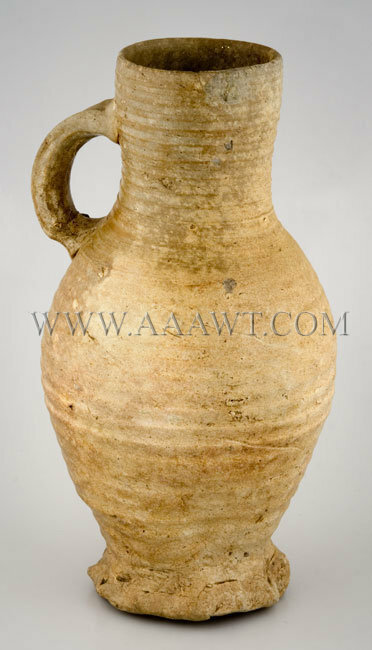 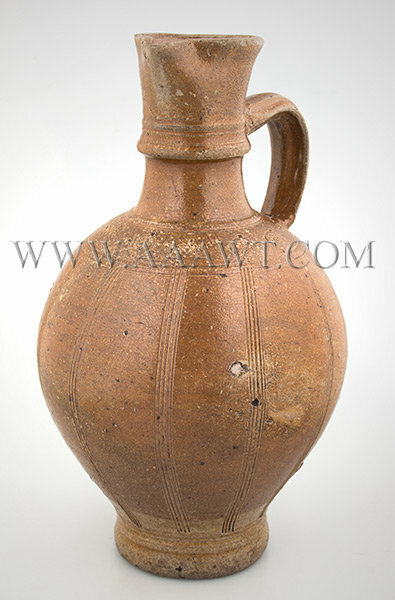 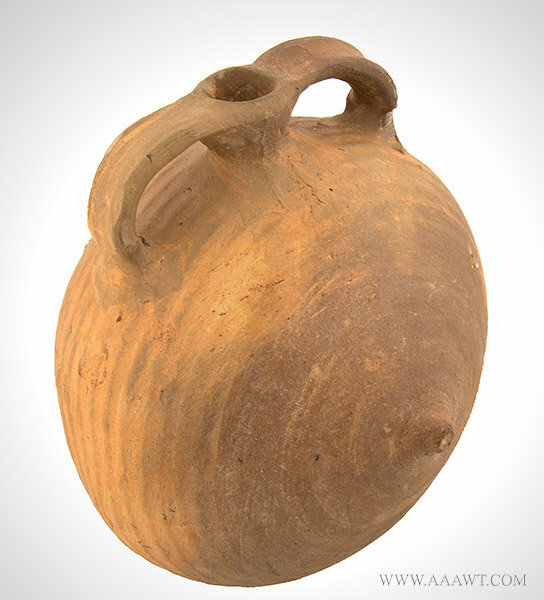 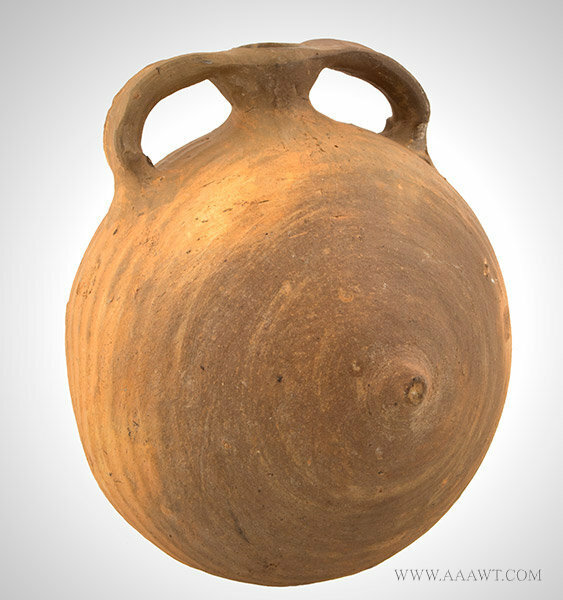 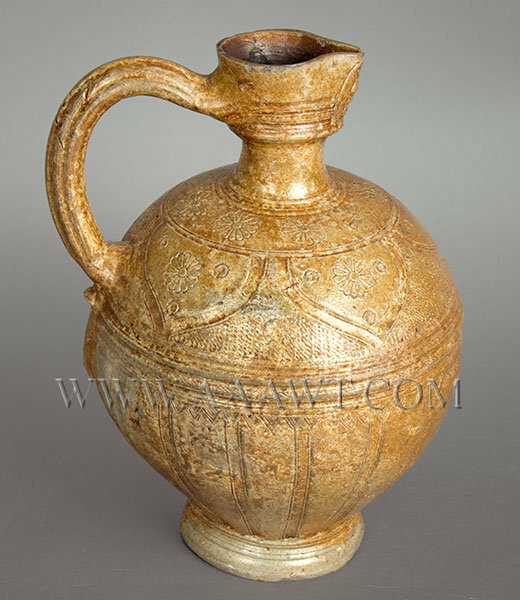 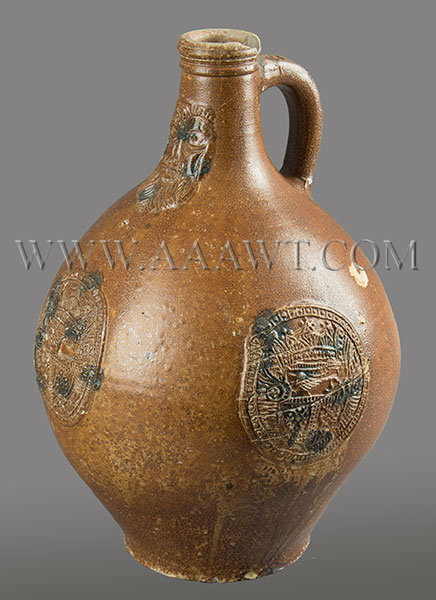 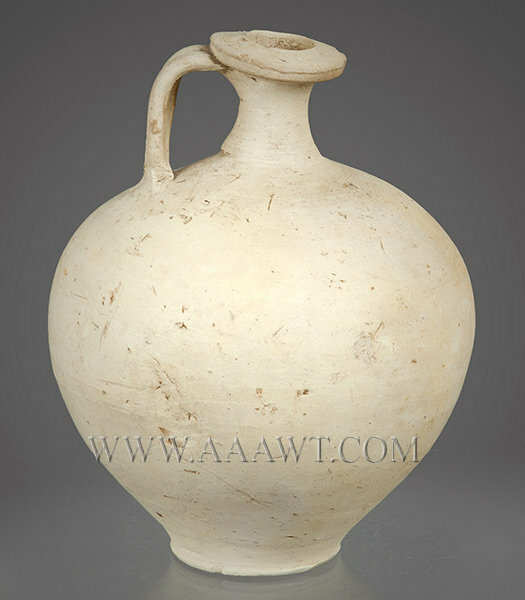 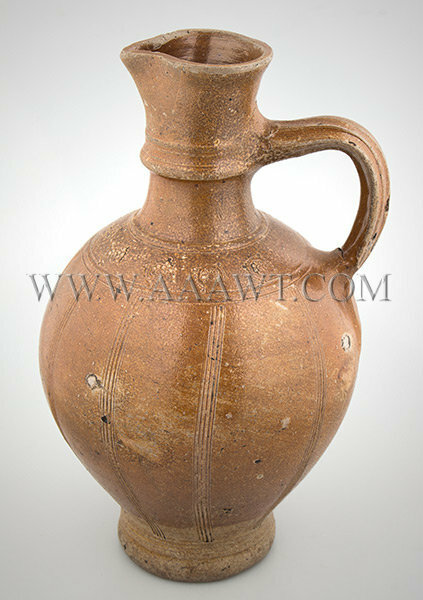 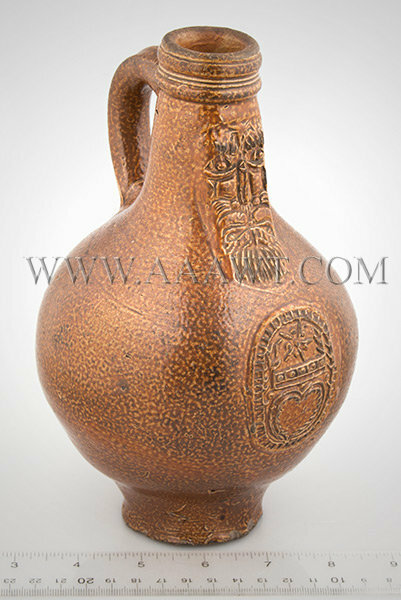 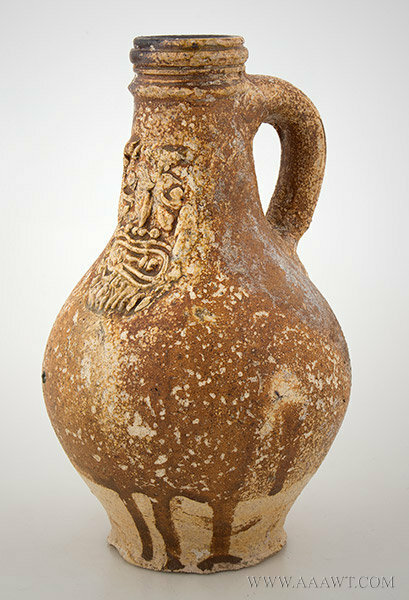 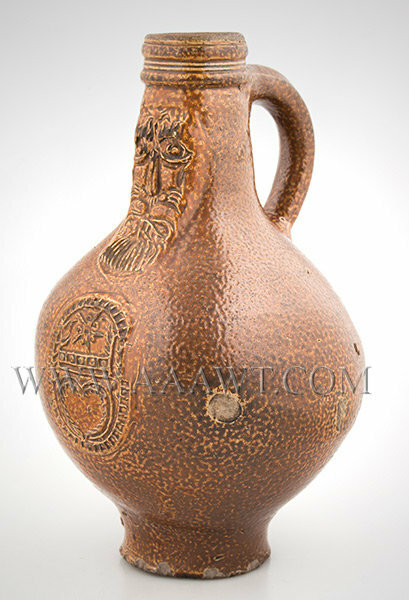 With strap handle, in prominent rilling on ovoid body. 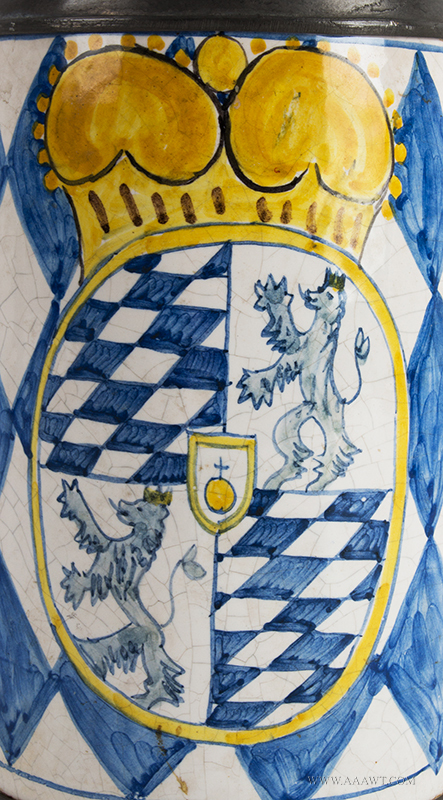 Found in the grounds of a castle in eastern Holland near the German border and Ruurlo. 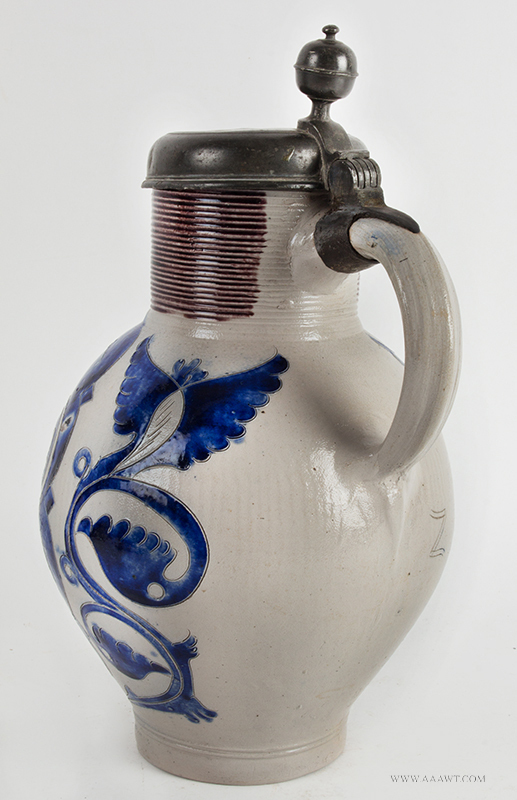 An ovoid jug of successful form with rounded spout, reeded neck, and ribbed handles touched with cobalt blue at the terminals. 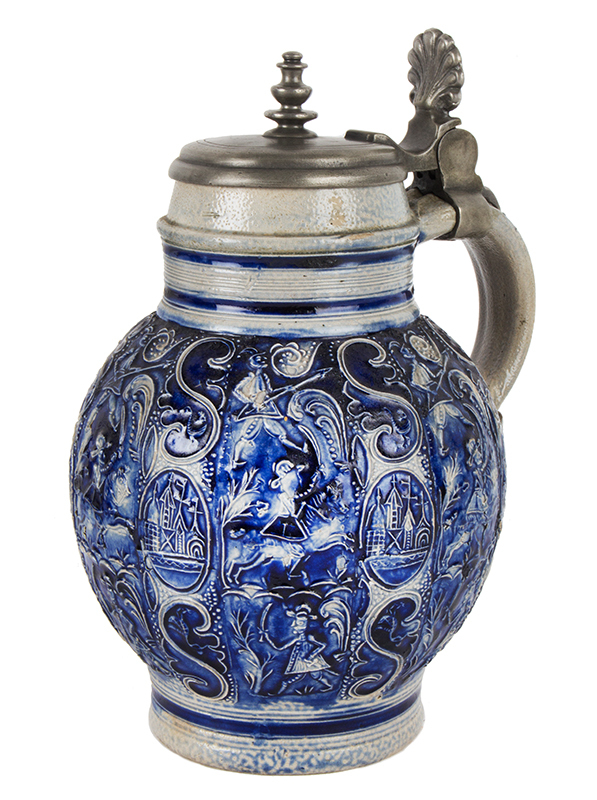 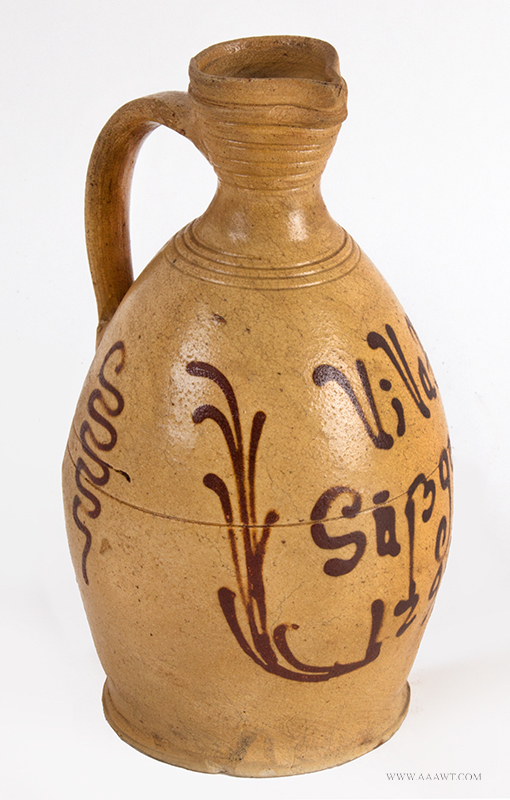 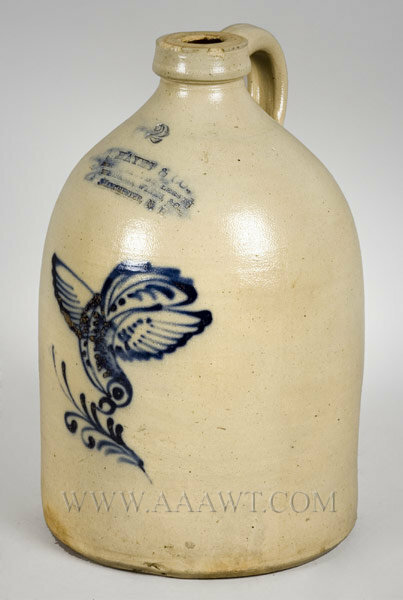 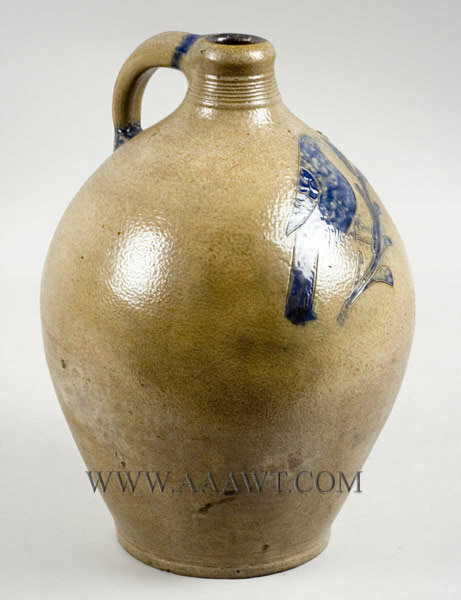 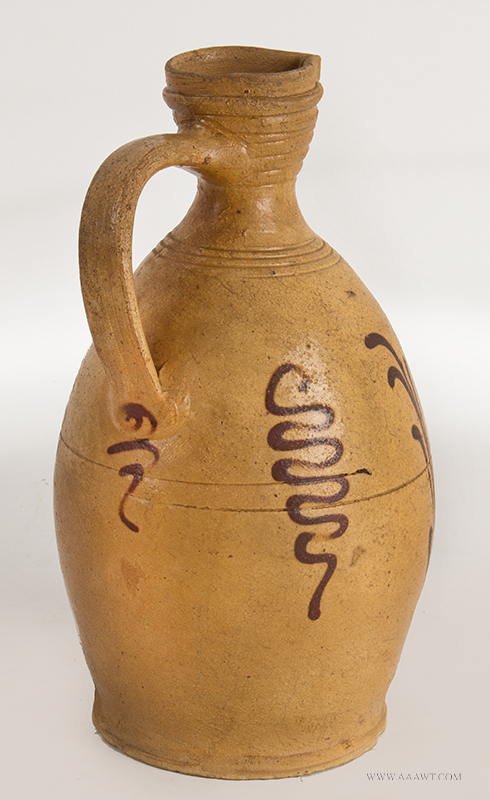 A scarce jug adverting whiskey and wine; straight sided with semi-squared spout decorated with a slip-trailed cobalt design of a bird about take flight off of a tree branch or flower stem. 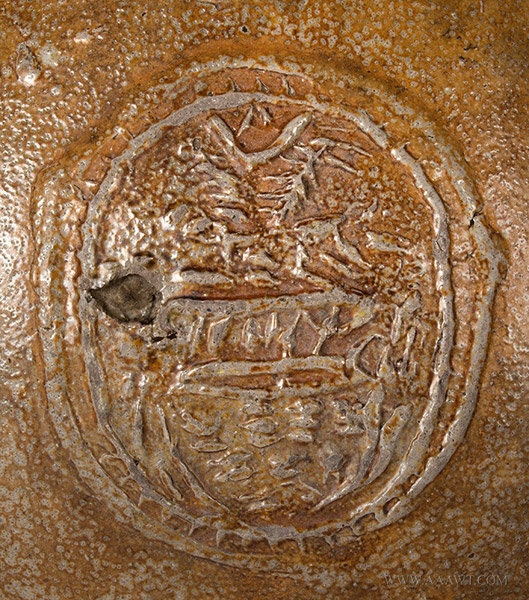 Bird depicted with a sense of motion, in a rare raised-wing stance with cobalt spots and feather detail to wings and body. 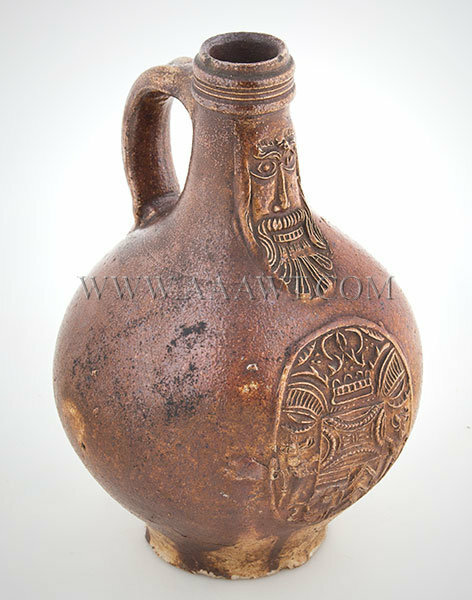 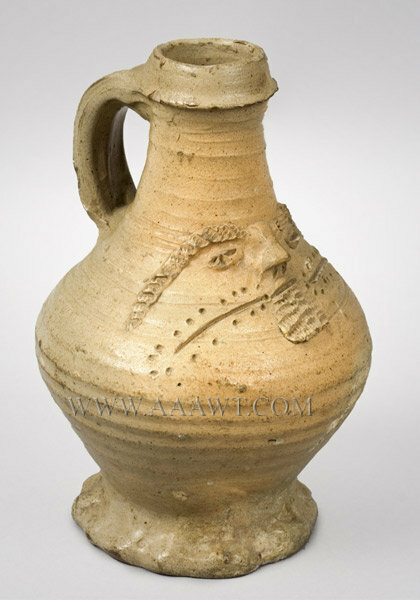 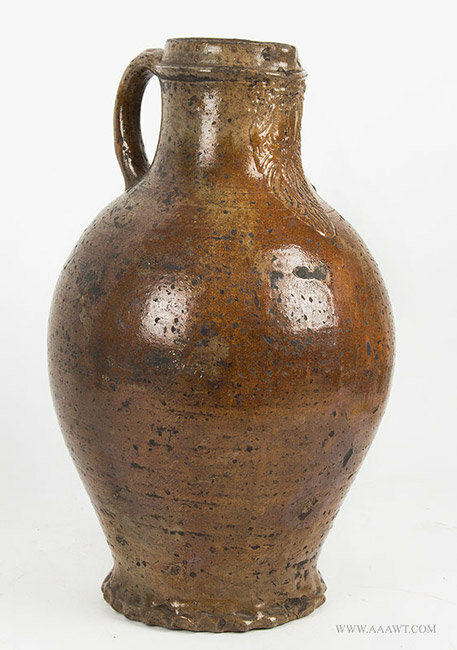 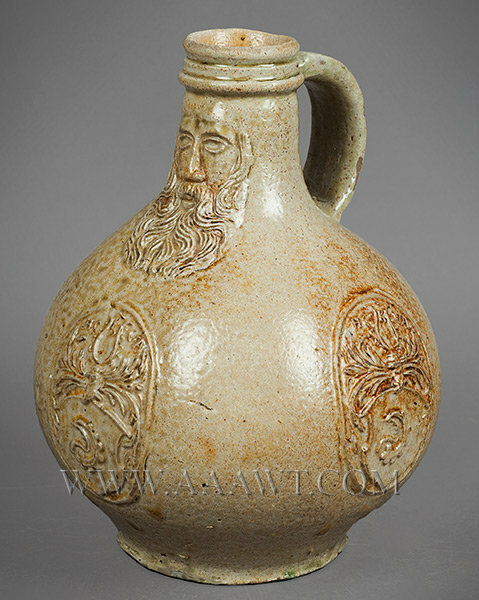 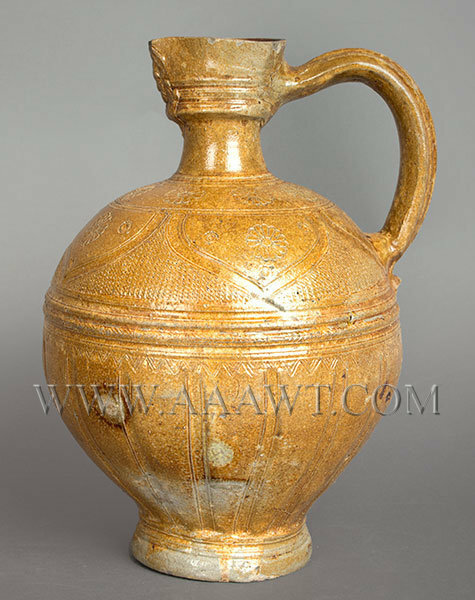 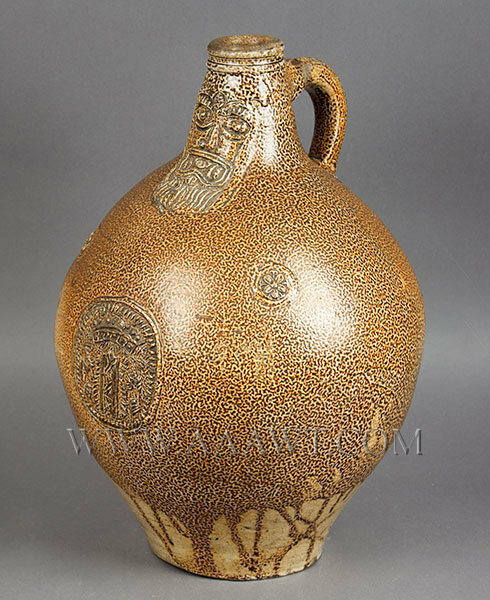 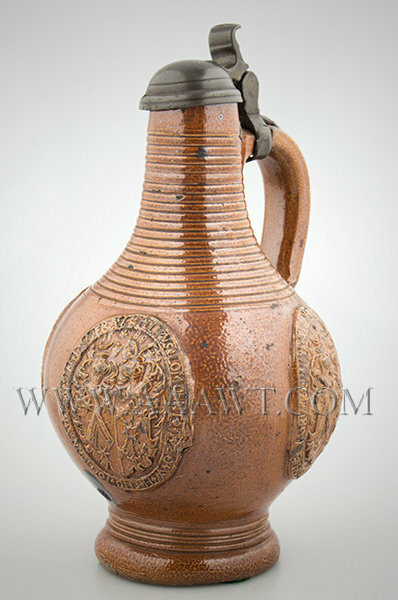 Jug impressed "HAYES & CO., / WHOLESALE DEALERS IN / W ? 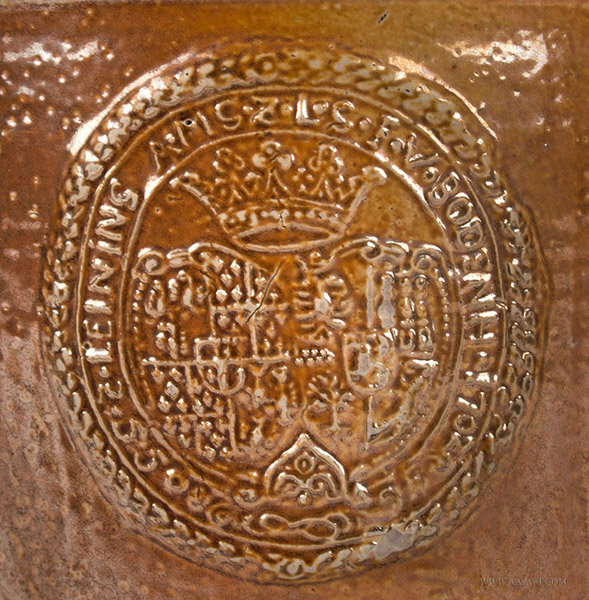 S, &C. / MANCHESTER, N.H." Some fry to cobalt; in-the-firing stone ping to shoulder and front. 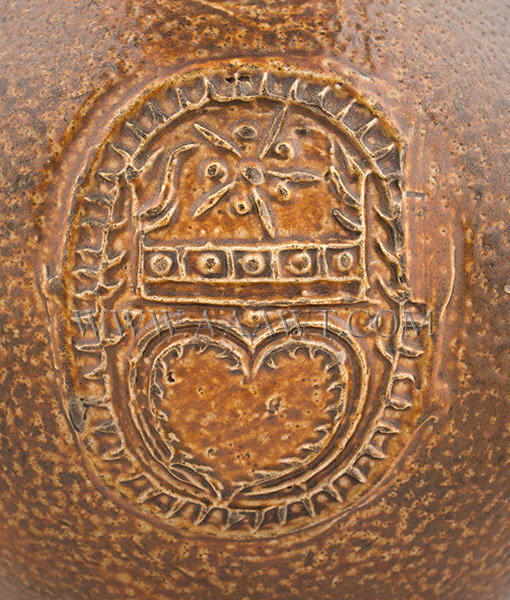 Additional small stone ping to bird's thigh. 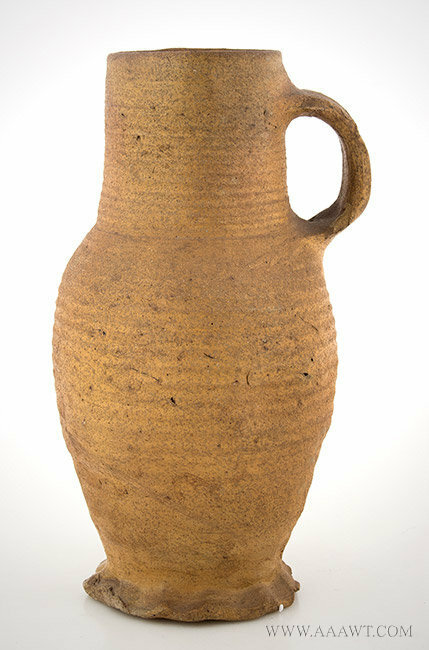 Dimensions: 14.5" H.